Before jumping feet first into yet another ‘new’ agricultural practise like intercropping, it is wise to first carefully consider the intricacies of the process – with all the associated pros and cons – and there really are two sides to this coin! One of the primary challenges for farmers today is to increase their output per hectare in a sustainable manner. Intercropping is essentially a multiple cropping practise that involves growing two or more crops in the same field. The primary goal of intercropping is to achieve the highest potential yield off a particular field by maximising the potential of the resources present at a given time. It is a system which has already been used traditionally by small-scale farmers in tropical climates where a cereal and legume intercropping combination is commonly found. Mixed intercropping – two or more crops are planted in a mix without a distinct row arrangement. Row intercropping – two or more crops are planted in distinct rows. Relay intercropping – two or more crops are grown at the same time as part of the life cycle of each i.e. a second crop is sown after the first crop has been well established but before it reaches its harvesting stage. Strip intercropping – growing two or more crops at the same time in separate strips wide enough apart for independent cultivation. Whenever two or more crops are planted together they will compete or facilitate (assist) for light, water and nutrients. Therefore, they could have a negative or a positive influence on each other. 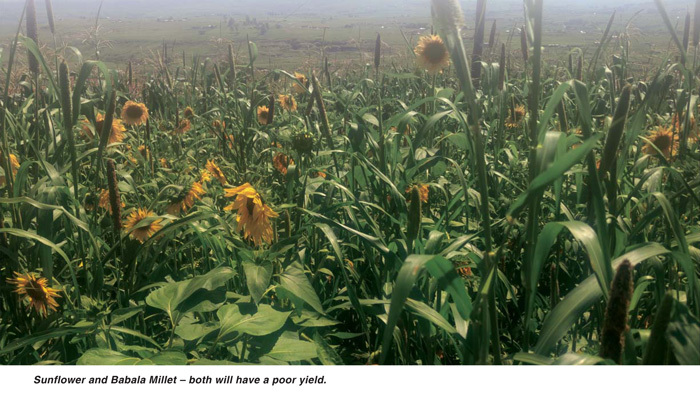 Successful intercropping depends on a good balance between competition and facilitation. Examples of strong facilitation is where legumes improve soil quality due to their nitrogen fixing character or where a second crop acts as a cover crop which shades the soils and increases water retention or serves as a windbreaker that shelters a crop or reduced wind erosion. The other side of the coin is where the secondary crop competes with the primary crop for moisture, space and nutrients. Why do farmers practise intercropping? The main motivation behind intercropping is to improve output per hectare but this can only be achieved with careful crop selection and continuous attention to detail. There are some farmers who use intercropping to improve the density of the organic material in the rows to reduce soil temperature and retain soil moisture. In this case they refer to the secondary crop as live mulching. This means it is important to understand each crop’s water requirements throughout the growing season. One of the main reasons for intercropping in a commercial enterprise is an attempt to address the need for animal feed, particularly during the dry season. 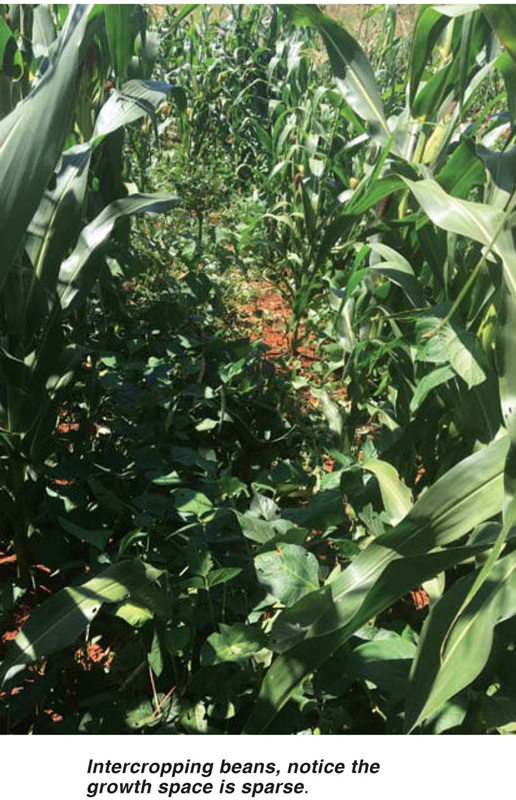 It is common practice for animals to graze on maize stover after the harvest has been completed however maize stover with its low protein content does not have high nutritional value. One way of improving the quality of the winter grazing then is intercropping. Potential increased crop yields per unit area. Improved soil fertility by leguminous intercrops e.g. nitrogen fixing. Reduced weed infestation (Mthembu et al., 2018: 363). Intercropping is not always suited to a mechanised farming system. Time consuming: It requires more attention and thus increased intensive, expert management. There is reduced efficiency in planting, weeding and harvesting which may add to the labour costs of these operations. Good planning is very important and includes careful cultivar selection, proper spacing etc. The biggest challenge to adopting intercropping systems is the advance planning of planting, cultivation, fertilisation, spraying and harvesting of more than one crop in the same field. The most common intercropping practised at the moment is probably the cereal-legume combination. Maize rows are inter-planted with either beans or cowpeas. Farmers with a strong livestock component in their farming enterprise like to intercrop with maize and cowpeas but then the whole maize plant is to be grazed by livestock. A farmer in the North West province plants some fields like this every year to cater for his flock of sheep and some cattle in the dry winter months. This has been a great success. In his system the maize cobs are not harvested for human consumption but are left on the plants to be grazed. The sums work out very favourably since there is neither mechanisation nor labour costs as essentially the animals ‘harvest’ their own food in situ. Farmers should select crops which are compatible. This means they will work well side by side and will either mature at the same time or one crop will ‘wait’ whilst the other matures. Careful selection of the plants to be intercropped and intensive management of the growing process is the key. What does the Grain SA Farmer Development Programme teach? Because farmer development needs to take place on many different levels and because we target commercial grain production, we do not promote or teach intercropping practises at present. Instead we encourage our team to focus farmers’ attention on the importance of optimising production potential through the use of best agricultural practises within a mono cropping and crop rotation system wherever possible. Our focus is on building healthy soils and maximising moisture conservation in the soils. We have declared war on moisture guzzling, nutrient draining weeds and promote soil sampling and excellent fertilisation practices. Farmers are encouraged to assess their own needs and to grow appropriately for the markets and their own households. Where a farmer identifies the need for diversity of production e.g. for household food security, we will rather encourage a farmer to divide a field into sub-sections and plant the crops on a rotational basis (not on the same piece of land at the same time). It is our belief that this empowers farmers to give their best attention to the progress of each crop without the challenges presented in an intercropping system – for example where beans start sending their tentacles to wrap around the maize stalks which hampers the maize harvest process. Intercropping could increase output per hectare but ONLY if the farmer has the expert knowledge necessary to select suitable crops; and ONLY if the farmer has the management expertise and time to input into the care of the crops. The key is to do your homework well and recognise the increased management requirements of this intensive farming system. Berry, S.D., Dana, P., Spaull, V.W. and Cadet, P. 2009. Effect of intercropping on nematodes in two small-scale sugarcane farming systems in South Africa. Nematropica 39:11-33. Mthembu, B.., Everson, T.M. & Everson, C.S. 2018. 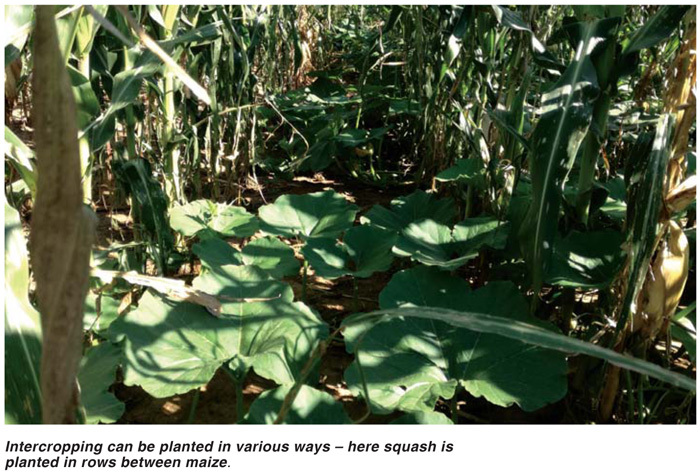 Intercropping maize (Zea mays L.) with lablab (Lablab purpureus L.) for sustainable fodder production and quality in smallholder rural farming systems in South Africa. Agroecology and Sustainable Food Systems Vol.42.2:362-382. Article submitted by Jenny Mathews, Pula Imvula contributor. For more information, send an email to jenjonmat@gmail.com.